If you are looking for shorts that looks amazing then come check out these striped layered shorts. 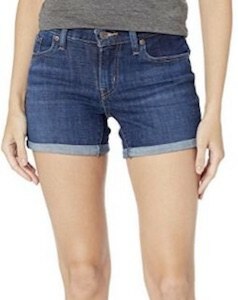 These women’s shorts are available in women’s sizes XSmall – 2XL and they are denim shorts made from 75% cotton, 23% polyester, and 2% elastane. The shorts are flat and striped on the back but the front look like they are made from layers and complete with a blue waistband that can be folded into a nice bow. As the layers are looking grace on the front it almost looks like it is a skirt. The denim shorts look nice and maybe even a bit formal but also playful and that makes them just perfect for almost any summer day. These women’s shorts show that you like the American flag as you find it all over the sporty shorts. These women’s shorts are sporty looking and short and the front and back are covered in red and white stripes while the waistband and the side is blue with white stars and together that makes these shorts look like the American Stars And Stripes flag. You can get these women’s shorts in sizes XSmall – Large and they are made from 60% cotton and 40% polyester. Shorts are great for summer and these pastel tie dye shorts are even better just because of the fun light colors. The women’s shorts are light blue, purple, and white and have 4 buttons and a zipper and 4 pockets. The high waist shorts may be short but that makes them just perfect for the hot days of summer. And you can get these cute shorts in women’s sizes 0 – 19 and they are made from 98% cotton and 2% spandex. Just find the perfect top and you are all set to bring some color to the world. If you want shorts that look more fun than just the straight cut most of them have then you should check out these shorts. The shorts come in two colors blue and the salmon color on the picture. As you can see the shorts have a flaring look making you even think that it is a skirt. 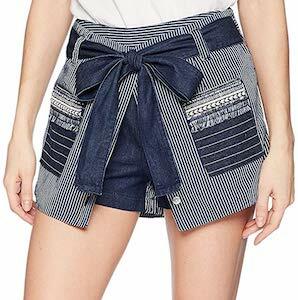 The ruffle hem makes that happen and that makes these shorts so unique. The waistband has an embroidered front and some lines on the side to complete the special design of this summer wear. You can get these 100% rayon shorts in women’s sizes XSmall – XL. 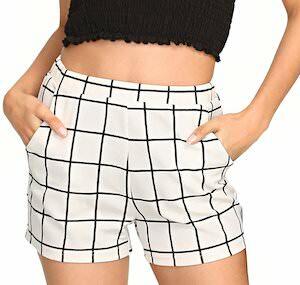 If you are looking for a pair of shorts that just matches so many outfits then these women’s shorts are what you need. The shorts have a gold and black color and mixed together that makes it look like a cool metallic and it even feels a bit shiny. The highrise shorts fall above the knee and have big pockets. Just pick a size between XSmall and Large and you are ready to have your own pair of cool metallic shorts. If you want to blend into nature then maybe wearing these camouflage shorts will work. But these women’s shorts are really short and have a low waist so they are more likely just great looking on you while you enjoy summer. These denim shorts have camouflage print all over and have a cutoff look on the bottom to make them even more perfect. Just pick a size and show the world your legs while wearing camo. Get your Women’s Low Waist Denim Camouflage Shorts for $8.59 and Free Shipping.